It’s just as important for the mind to get exercise. I am an avid amateur cyclist and, for those of you that don’t know much about cycling, there are different levels for amateurs. In road racing, all male cyclists begin at Category 5. Without going into exactly what moves a cyclist up the ranks, just understand that the lower the category number, the better the cyclist. Category 1 is the highest level. At this point cyclists have proven their abilities and are even invited to ride with the U.S. Olympic Cycling team, to race against the top pros in the world. Category 1 amateurs are considered some of the top cyclists around the globe. Why am I telling this story? Because one of them was me. 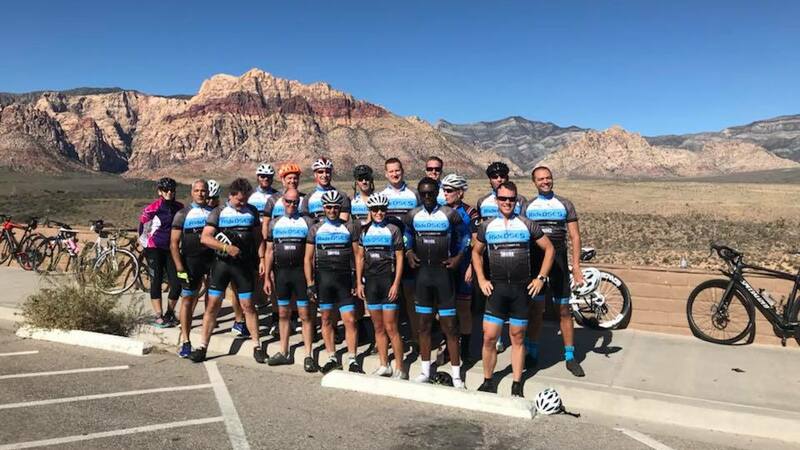 Each year, before and during the DrivingSales Executive Summit, DrivingSales and IM@CS organize bike rides and Clarivoy partners up with industry friends including Flick Fusion, Dealer Inspire, Dominion Dealer Solutions and EAutoAppraise to show support. Given my background and love for cycling, I immediately brought Clarivoy in as a sponsor because fitness, exercise and living a healthy lifestyle are vital ingredients to feeling good and performing at your best in real life. These rides provide DSES attendees with an opportunity to do just that. To achieve Category 1 took a lot of work. I didn’t simply start out racing 120+ miles. It was a process that involved repetition, determination and the desire to improve. It was hard work, but I progressed because I put my mind to it — determined to succeed. Success took practice. It wasn’t always easy, but I kept pushing myself to get better. In cycling – and participating in other fitness activities – it’s not just the physical body that needs practice to achieve peak performance. It’s just as important for the mind to get exercise, to push yourself mentally to achieve the highest levels of acuity. Now, why am I talking about cycling? Well, my story is a great analogy for any business activity. And, tying this over to our automotive industry, especially in marketing (both digital and traditional), there is no way anyone can succeed without pushing themselves to be competitive, constantly learning more to keep up with the trends and new technologies. Failure to do so will simply result in the inability to keep up with the “peloton,” and you will inevitably fall behind. The DrivingSales Executive Summit is an event held every Fall that allows dealership employees to exercise their minds, stay on top of new technologies and strategies, keep up with the competition and win the race. Unfortunately, it’s estimated that only 5 percent of dealerships invest in their employees by sending them to these industry events. By simply attending, taking notes, and implementing the strategies learned upon returning to your dealership, you can place yourself at the front of the pack. At this year’s DrivingSales Executive Summit educational topics include how to hire and retain employees, how to create pay plans and how to build a culture that promotes employee retention, customer engagement and loyalty. Other sessions are focused on fixed operations, including finding talent, retaining service customers and effective marketing for customer acquisition. The customer experience is extremely important nowadays as a differentiator. There are plenty of sessions where you can learn how to create a better buying experience, make your operations more efficient, increase F&I revenue and dive into the new realm of digital retailing. Of course, branding, mobile, social and video marketing and lead generation are also represented, alongside inventory and pre-owned sessions, search engine optimization and, my favorite, attribution. And let’s not forget the amazing keynotes the DrivingSales team has arranged. This conference presents a fantastic opportunity for dealership employees to not only learn from industry experts, but also from their peers within the automotive industry. And, just like the title of this blog, which is a quote from the famous American journalist and author Hunter S. Thompson, it presents an opportunity to exercise your brain, learn how to improve and how to then continue that forward momentum to keep your dealership both in the race and winning it. If you’re attending this year’s DrivingSales Executive Summit, I will be presenting a session that teaches six insights into how to sell more, spend less and beat your competition in this very competitive automotive industry. I invite you to attend my session, Monday, October 22 at 10:00am, at the DrivingSales Executive Summit, October 21-23, 2018. Buy the ticket, take the ride. You won’t regret it. I’ll see you there!